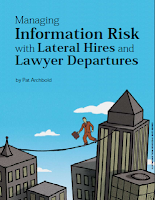 The first, written by Pat Achbold, head of the risk practice group at IntApp, "Managing Information Risk with Lateral Hires and Lawyer Departures," explores current trends in law firm ethical screening practices and looks at current industry standards for confidentiality management and enforcement/compliance tracking. The second article is written by John Guyer from Hinckley, Allen & Snyder LLP. In it, he describes how his firm is using confidentiality management technology to protect the firm and track compliance in reposnse to issues including ethical screening rules, client confidentilaity requirements and new data privacy standards like the HITECH Act and the Massachusetts Privacy Law.